C Mike Zunino hit .395 with five homers and 12 RBIs in spring training, but hasn’t played this season after straining an oblique muscle March 28. 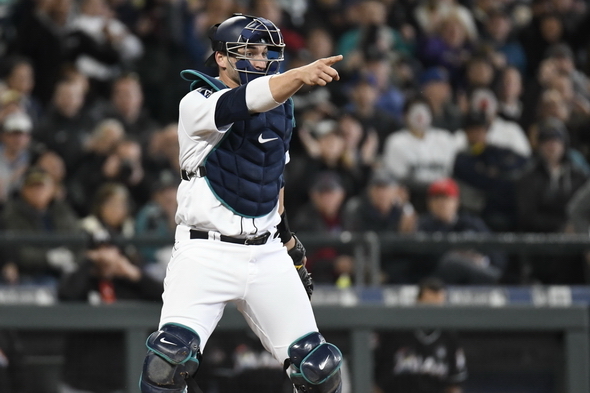 C Mike Zunino has returned and will hit seventh in his regular-season debut at 5:05 p.m. Friday in Texas when the Mariners (9-8) begin a 10-game trip with three against the struggling Rangers (7-13) at Globe Life Park. He’ll catch Felix Hernandez, who has given up 12 hits and 11 runs in a combined 9.2 innings his two road starts this season. The Mariners are desperate for Zunino’s spring training bat, because they scored just six runs in four Safeco Field games, losing three, to Texas’s other team, the Astros. Houston’s starters in the final three games held the Mariners to a collective .161 batting average. The Mariners lost 9-2 Sunday when starter Charlie Morton threw seven shutout innings and gave up three hits. And that was without having to face their ace, Justin Verlander. Zunino strained an oblique muscle during a March 28 batting practice at Safeco after the team arrived from spring training, where he hit .395 with five homers and 12 RBIs. He didn’t show much recovery in three rehab games at Class A Modesto, getting a single hit in 11 at-bats. But he is replacing Mike Marjama, who in 10 games replacing Zunino also hit .111 (3 for 27). Marjama was sent down to AAA Tacoma to make room for Zunino, meaning David Freitas (.286) will remain as the backup. With the return of Ben Gamel (oblique) to his starting spot in left field this week, the Mariners are missing only 1B Ryon Healy (ankle sprain) from their scheduled opening-day lineup. Healy is on a rehab assignment to AA Arkansas. If all goes well could join the club in Chicago or Cleveland. That would mean the Mariners will have to make a decision on whether to keep Ichiro (hitting .212) as a fifth outfielder instead of sending down a younger player.